With a whole lot of features and goodies, Suffusion comes with a side that is witty and classy at the same time. A lot of terms apply very well to Suffusion, and are often firmly tongue in cheek. Usage: The featured content widget is suffused with options. Usage: Download this suffu-scion to get started. Usage: This suffu-science will teach you how to build different headers for different pages. Usage: The options for date box customization suffice. Usage: verb: I am going to suffu-shun. noun: This is suffu-shun. Usage: Some suffurers have been with the theme since the very first release. Usage: Sayontan is the Sufführer for the Aquoid forum. Douglas Adams’ The Long Dark Tea-Time of the Soul introduces the concept of an I Ching Calculator, where everything calculated to a value greater than 4 results in “a suffusion of yellow”. Interestingly enough, of all the skins in Suffusion, there is none that is based on yellow. Maybe the theme hasn’t yet evaluated to 4 or more in some mathematical world. 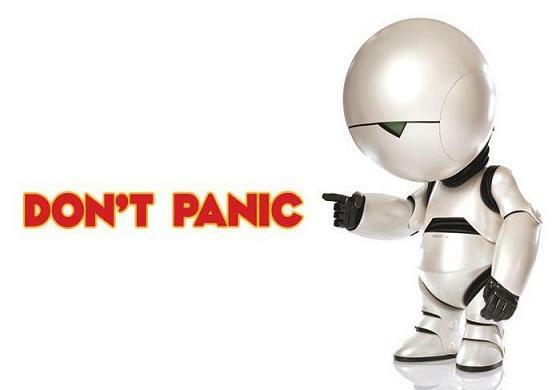 Immortalized in the Hitchhiker’s Guide to the Galaxy, the words “Don’t Panic” are meant to reassure you, and yet result in quite the opposite effect. Originally a picture of Marvin the Paranoid Android used to be bundled with the theme. Marvin, from Buena Vista's "Hitchhiker's Guide to the Galaxy"
As it would happen, this well-intentioned bit of humour did go over a few heads! But Douglas Adams rules the world of Suffusion, and the panic warning stays.